Nottingham Forest manager Alex McLeish has left the Championship club by mutual consent after 40 days in charge. The 54-year-old Scot cited "a difference of understanding of the development strategy" at the club as the reason for his exit. Chairman Fawaz Al Hasawi told the club website: "I'm bitterly disappointed - as is Alex - it has not worked out." McLeish was appointed on 27 December but only won one game out of seven and lost four of those matches. The Kuwaiti owners are now looking for their fourth manager since taking over in July. Billy Davies: Jan 2009-Jun 2011. Games: 126 - Wins: 53 - Draws: 36 - Lost: 37. Steve McClaren: Jun 2011-Oct 2011. Games: 13 - Wins: 3 - Draws: 3 - Lost: 7. Steve Cotterill: Oct 2011-Jul 2012. Games: 38 - Wins: 12 - Draws: 7 - Lost: 19. Sean O'Driscoll: Jul 2012-Dec 2012. Games: 26 - Wins: 10 - Draws: 9 - Lost: 7. Alex McLeish: Dec 2012-Feb 2013. Games: 7 - Wins: 1 - Draws: 2 - Lost: 4. 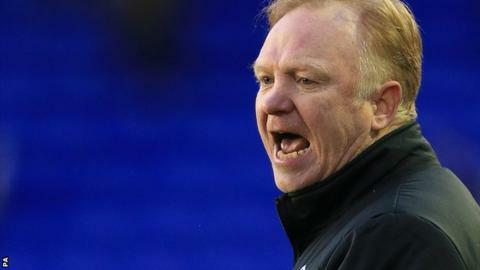 McLeish was understood to be angered by the club's failure to sign players during the January transfer window and refused to commit his future to the club following Saturday's defeat against Birmingham City. A deadline-day deal for Peterborough United's George Boyd fell through at the last minute when the midfielder failed an eye test, while to add insult to injury, another target Chris Burke scored both goals in Birmingham's win at St Andrew's. In a statement issued by the League Managers Association McLeish said: "I am extremely saddened to be leaving after such a short period but even so it has been a privilege to be manager of such a fantastic football club. "Both parties entered into the relationship in good faith, however, there was a difference in the understanding of the development strategy of the football club and it was felt by both parties that we should part company. "I want to thank the players, staff and fans for their support and wish Nottingham Forest the best of fortunes ahead." Al Hasawi, who last week issued a statement denying a rift with his manager, added: "I would like to put on record my thanks for his services and wish him every success in the future." Forest have said they will not be making any further comment. The Al Hasawi family sacked the then manager Steve Cotterill within days of assuming control in the summer. They promised an iconic name as a replacement but after being linked with Glenn Hoddle and several other "big-name" managers, they appointed former Reds coach Sean O'Driscoll. McLeish took over on 27 December, that's not enough time to get a carriage clock. At the heart of this is the January transfer window. We understand that Alex McLeish was promised around £3m to wheel and deal for players. The one that really annoyed him was George Boyd signing from Peterborough. He thought he had him for £500,000 but then the owners pulled out. Although Boyd passed a medical the owners said he had an eye problem so they would not be proceeding with it. McLeish thought that was ridiculous. He guided a new-look Forest to a point outside the play-off places but was sacked on Boxing Day after an impressive 4-2 victory over Leeds United. However under McLeish they have won just one of their six Championship matches, and are now in 11th place. They are are six points adrift of Middlesbrough in sixth spot, having played a game more. McLeish's side also suffered a shock home defeat against League One strugglers Oldham Athletic in the FA Cup. Reds midfielder Andy Reid had said on Monday that he would be sad to see McLeish leave. "Everyone is happy with how he is - an honest, straight manager," Reid said. "For me, as a footballer, that is all that you want because that is how I feel I am as a player. "I've enjoyed working with him since he has come in and it would be very, very disappointing if he did leave."